Traditional markets in Seoul are one of the best places to experience the coexistence of modernism and tradition all at once. Every market bustles with vendors of all kinds as well aplethora of delicious street food. When looking for a place to either shop or eat, a visit to one of these Korean marketplaces is a must! After the Korean War, a rapid population growth took place in Seochon near Gyeongbokgung Palace; as a result, an increasing number of vendors and stores formed around the area. These vendors and stores developed into a busy marketplace now known as Tongin Market. Tongin Market is estimated to have at least 80 vendors and stores as of today, which mainly consist of restaurants or food stalls. What sets Tongin Market apart from the other markets is the Dosirak Café. At the Dosirak Café, you can buy a lunch tray and 10 yeopjeons (old Korean currency) for 5,000 won. 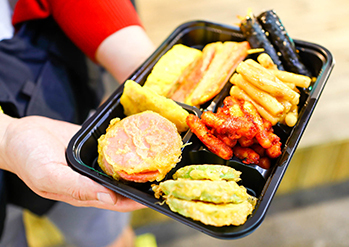 You can use the yeopjeon to buy food and fill your lunch tray as you tour around the marketplace, offering both a fun and unique dining experience. Gyeongbokgung Palace, Gwanghwamun Gate, and Samcheongdong-gil Road are some nearby attractions that are easily accessible from Tongin Market. Namdaemun Market is a traditional market with a history of over 600 years. It offers over 1,700 varieties of goods at affordable prices which include pottery, clothing, accessories, kitchenware, and regional specialties. It is also known as one of the best marketplaces to buy traditional handicrafts, glasses and sunglasses. In particular, Namdaemun Market is famous for delicious foods such as, guksu (noodles), jokbal (pig’s trotters) and galchi jorim (stewed beltfish). Popular attractions like Myeong-dong, Deoksugung Palace, and Gwanghwamun Gate are located nearby, making the market a perfect place to stop by after a tour of the neighborhood. Gwangjang Market was the first permanent market established in Korea and dates back to 1905. The first thing that comes to mind when Koreans hear the name “Gwangjang Market” is none other than food. The endless strip of food vendors in the market is quite unique, with each vendor crowded with lines of people waiting to experience mouthwatering food. The stores and food vendors serve popular Korean foods like bindaetteok (mung bean pancake), gimbap, bibimbap, and sundae (blood sausage). The Noryangjin Fisheries Wholesale Market is Korea's largest wholesale fish market that has a history of more than 90 years. Recently, the facilities in the market underwent renewal, providing a clean environment to buy fresh seafood. The market is open and busy 24 hours a day. At dawn, shop vendors open fish auctions for wholesale and by evening, the market is bustling with customers looking to buy fresh fish. Another unique experience to enjoy at Noryangjin Fisheries Wholesale Market is having your purchased seafood cooked or prepared to eat at any of the restaurants located upstairs. The market is connected to Noryangjin Station (Seoul Subway Line 1 and 9) via passageway. Opened in 1985 as the first public wholesale market in Korea, Garak Market is a large market complex divided into different sections. This is also where the standard unit price for vegetables and seafood is set before they are distributed to other regions. As Garak Market is extremely large, visitors are recommended to take advantage of the market map and plan which sections to visit within the market ahead of time. 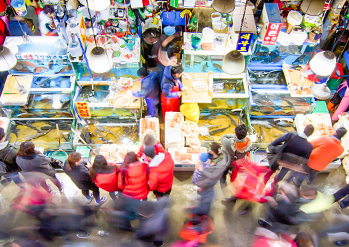 Popular traditional markets are not only found in Seoul, but also spread throughout the country. Traditional markets located outside Seoul offer unique regional specialties, with each market opening doors to a world of new discovery. In addition, major tour attractions located nearby make the markets a convenient place to stop by while sightseeing. Jeju Dongmun Traditional Market is prestigious for providing the freshest ingredients caught right from Jeju's seawaters. Visitors will be able to get a taste of freshly caught fish prepared as hoe (sliced raw fish) or some of Jeju’s local food and produce such as omegi tteok (Jeju-style rice cake), gogi guksu (meat noodle soup), and hallabong citrus fruit. The market not only has delicious foods but also souvenirs, making the market a popular shopping attraction among tourists. Busan Gukje Market is a major attraction in Busan. The market served as a filming site for several films and variety shows, which only boosted the popularity even more. Lines of souvenir shops and wholesale dealers selling machinery, electrical supplies, kitchenware, and clothing can be found along the maze-like market streets. Popular foods at Busan Gukje Market include bibim dangmyeon (spicy glass noodles), yubu jeongol (fried tofu hot pot), and ssiat hotteok (seed-filled griddlecake), which are all specialty foods of Busan. Busan's Bupyeong Market, also known as the Kkangtong (tin can) Market, is the first night market to have opened in Korea. Although the market remains open during the day, it really comes alive at night with bustling visitors and lines of vendors serving street foods from all over the world. 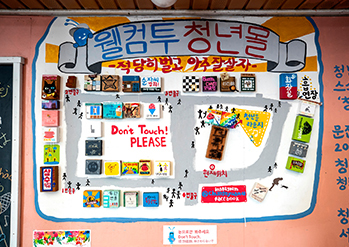 Other attractions such as Jagalchi Market, Yongdusan Park and Bosu-dong Book Street are also nearby, allowing visitors to conveniently explore the neighborhood. Chuncheon Romantic Market, a popular traditional market in Chuncheon, is famous for its delicious dak gangjeong (glazed fried chicken bites) and dakgalbi (spicy stir-fried chicken). The market opened in 1960 and since then, it has been selling a wide variety of goods, including hanbok, bags, shoes, clothes, electronics, jewelry, food, and more. The market has a modern look as the result of a redevelopment project that started in 2002. Artwork depicting scenes of Korea’s traditional marketplaces decorate the alleys, allowing visitors to enjoy art as they explore the market. Jeonju Nambu Traditional Market is located in Jeonju, a popular tourist destination known for its beautiful hanok village and a highly reputed film festival. The market has a history of over 100 years, and it continues to attract new and returning visitors alike even as of today. It gives off a traditional atmosphere with its hanok street as well as popular menus, such as kongnamul gukbap (soybean sproutand rice soup). The latest trending attraction in the market is Cheongnyeon (Youth) Mall. It is a commercial area filled with restaurants and handicraft shops owned by young entrepreneurs. Cheongnyeon Mall has been gaining much attention as it adds a vibrant and youthful energy to Jeonju Nambu Traditional Market. If you are planning to visit Gyeongju, one of the top must-go destinations in Korea, don’t forget to add Gyeongju Jungang Market to your itinerary. Gyeongju Jungang Market opened in 1983 and currently consists of approximately 700 shops and vendors that sell a variety of products such as clothing, cooking oils, vegetables, and meat. Recently, it has opened a night market and is now bustling with tourists day and night. Incheon Sinpo International Market is located near Incheon Port International Passenger Terminal and it has been considered Incheon’s representative market for over the past 100 years. 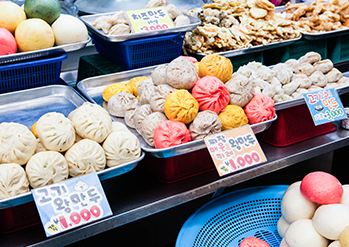 The market is most popular for its delicious treats, such as dak gangjeong, jjinppang (steamed buns), and dumplings. In addition, the market offers much to see and enjoy with its charming decorations and a Lighthouse Park that serves as a venue for exciting festivals that are held every year. Suwon Paldalmun Market refers to one big marketplace formed by two smaller markets that are in close proximity with each other, Yeongdong Market and Jidong Market, both located near Paldalmun Gate in Suwon. Suwon Paldalmun Market is quite noteworthy as it is the only market in history to be founded by a king. Uniquely designed clothing, bags, and shoes offered at affordable prices are just a few of the many merits that attract customers of all ages. Visitors can also participate in significant cultural events like the Moonlight Tour at Suwon Hwaseong Fortress and Suwon Hwaseong Cultural Festival held at nearby attractions. Daegu Seomun Market is the largest market in Daegu and the most famous distributor of fabrics within the country. 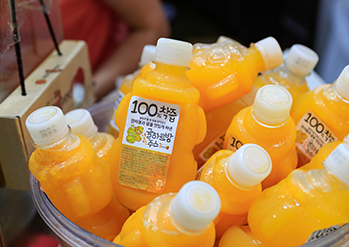 Over 4,000 stores can be found in the market, selling a variety of products ranging from hanbok, blankets, clothing, dishware, and more. 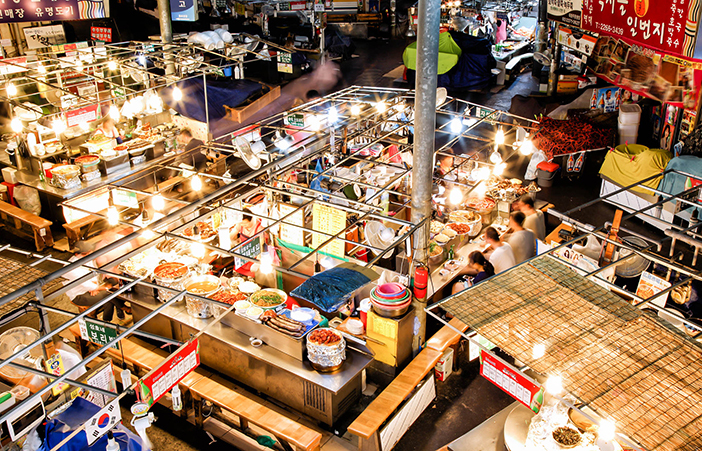 A plethora of delicious goods is also found at this market including popular menus such as marinated eomuk (fish cake), flat dumplings, and chapssal sujebi (hand-pulled sticky rice dough soup). Located in Seongnam-dong area, Gangneung Jungang Market is the major market of Gangneung, Gangwon-do. There are over 500 registered stores and vendors operating within the market as of today. Agricultural crops and local produce such as semi-dried squid and other dried seafood from nearby areas are all brought to this market. In addition, Gangneung Jungang Market is full of delicious regional cuisine such as memiljeon (buckwheat pancake) and gamja ongsimi (potato ball soup). 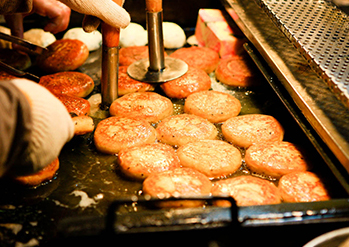 Foods made using Gangneung’s unique local recipe, such as dak gangjeong and octopus bread, are popular as well. Located right across from Tongyeong Port Passenger Terminal, Seoho Market opens early every morning, providing a variety of breakfast options for people traveling to and from the port. Haejangguk is a popular breakfast menu, especially on cold mornings, as the hot soup served with rice warms up and recharges your body for the day ahead. Tongyeong Jungang Market is also located nearby, serving as a convenient stop.